Shipping containers come in lengths of up to 53 feet, meaning that relatively large offices and living spaces can be created within a single shipping container. However, for practicality in cost and shipping, the 40-foot length is what’s typically used. When a larger office space is needed, you can create a shipping container office using stacked Conex boxes, creating a multi-level building that fits a great deal of office space into a compact area. 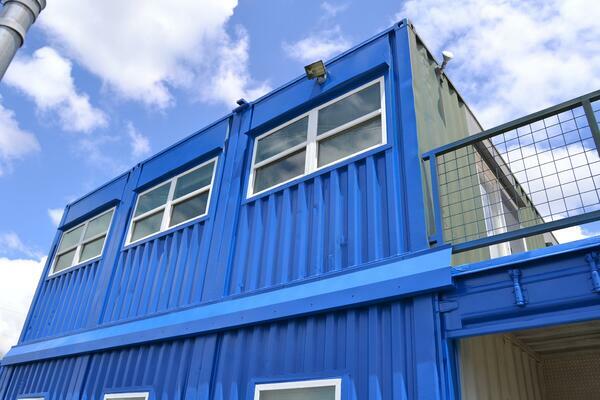 Multi-level shipping container offices can be equipped with numerous features to make communication and access between the various parts of the office effortless. For example, the office can be equipped with both interior and exterior stairways. This allows for travel between office spaces that mimics the functionality of traditional office buildings. While Conex boxes can be stacked, they can also be joined to create wider office spaces. The choice will depend on your business needs. If you are placing your shipping container office in an environment with limited surface area, or if you would like stricter partitions between each component of the office, a multi-story office may be best. What can a conex office hold? In addition to these basic amenities, you can choose more advanced options to make your office more customized and homey if needed. For example, you might opt for a custom paint job either inside or outside of the container. Floors, lighting, and windows can all be adjusted to meet each individual company's needs, which tend to vary based on environment, budget, and personal preferences. You can choose specialized wall coverings or floor finishes, specialty shelving or cabinetry, even advanced security features.